Try something new for dinner with this simple spaetzle recipe! We’ll show you how to make spaetzle from scratch! Mix the flour, salt and nutmeg. Add the milk to the dry ingredients. Press dough through spaetzle maker or form by hand. Add the bullion cubes and dissolve. Drop small batches at a time into simmering liquid. Cook 5 to 8 minutes. 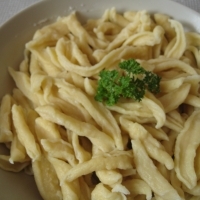 Saute cooked spaetzle in butter or margarine.